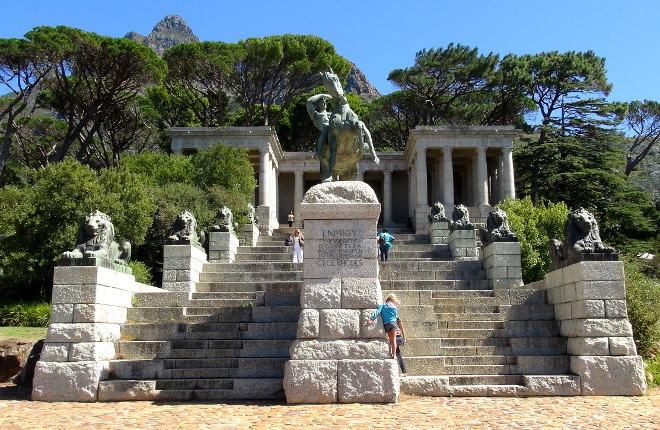 Rhodes Memorial is a structure that was built in 1912 on the slopes of Devil's Peak a short hike below the block house, and above the University of Cape Town. The edifice was built by Sir Herbert Baker in remembrance of Cecil John Rhodes who lived between the years 1853 to the year 1902. With its spectacular views, it's a popular spot for tourists to visit, those who've just got married to get photos taken, hikers to start their trip up and families to come for lunches. The structure has 49 steps, one for each year that Rhodes lived, leading up to a statue of the man leaning his head on his right hand. Below the statue is inscribed: "THE IMMENSE AND BROODING SPIRIT STILL SHALL QUICKEN AND CONTROL. LIVING HE WAS THE LAND AND DEAD HIS SOUL SHALL BE HER SOUL", which I understand is an extract from a Rudyard Kipling poem, Burial. 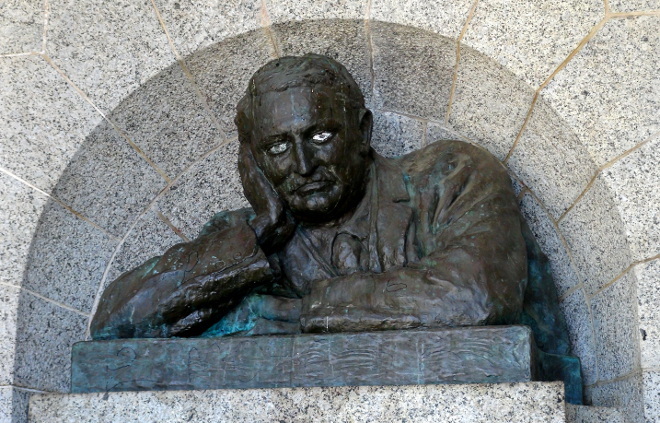 Above the statue it says: "TO THE SPIRIT AND LIFE WORK OF CECIL JOHN RHODES WHO LOVED AND SERVED SOUTH AFRICA. 1853 - 1902". On each side of the steps are 4 lion statues (which visitors to the memorial like to sit on & have their photo taken, although this is not recommended as there is quite a drop to the side of the lions). 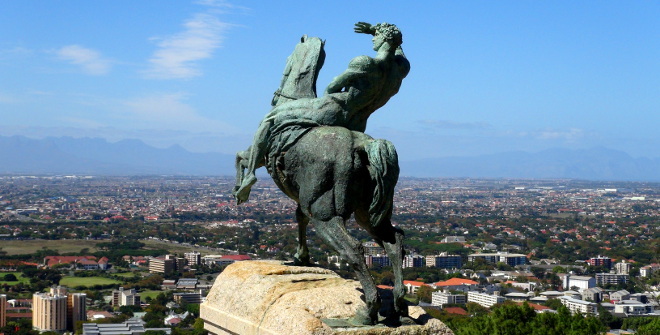 At the bottom of the steps is a bronzed horseman with the horse having one leg raised in the air and the horseman shading his eyes from the sun as he looks out over Cape Town's northern suburbs. 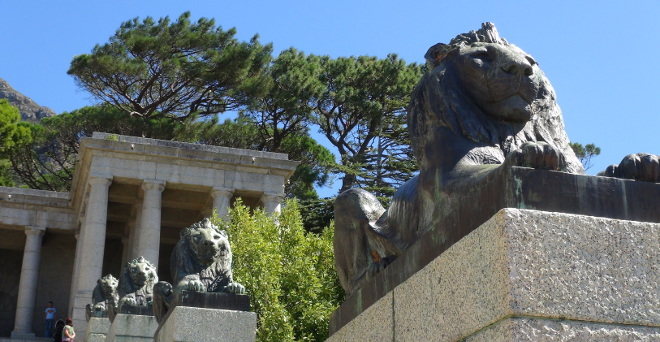 The following words are chiselled into the blocks of Cape granite below the horseman: "ENERGY, THE WORK OF GF WATTSRA, AND BY HIM GIVEN TO THE GENIUS OF CECIL RHODES". The terrace of the steps is semi circular in nature and at the top of the steps is a monument of pillars that is rectangular - shaped. Granite is used to line the stairs and on the granite is the structure of eight lions. Perched on the slopes of Devil's Peak, one enjoys views from the monument stretching from Table Bay to False Bay. In the distance over the Cape Flats one can see the Hottentots and Helderberg mountain range. In the foreground here's a photo of Mowbray in the vicinity of the Mowbray Maternity Hospital. The grey building on the bottom right of the photo is part of the Department of Rural Development - National Geo-Spatial Information. Here we can see the Red Cross War Memorial Children's Hospital, with Rondebosch Common in the foreground. 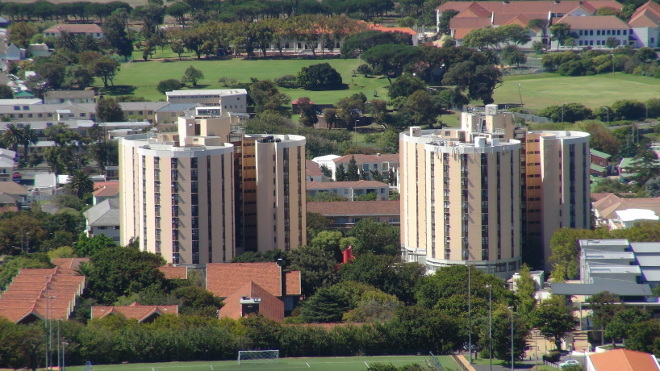 Lots of studying happens in these 2 towers - they are the Tugwell & Leo Marquard residences of the University of Cape Town (other stuff happens too!). In the background are the beautiful grounds of Rustenburg Girls High School (where there's also a lot of learning occurring). 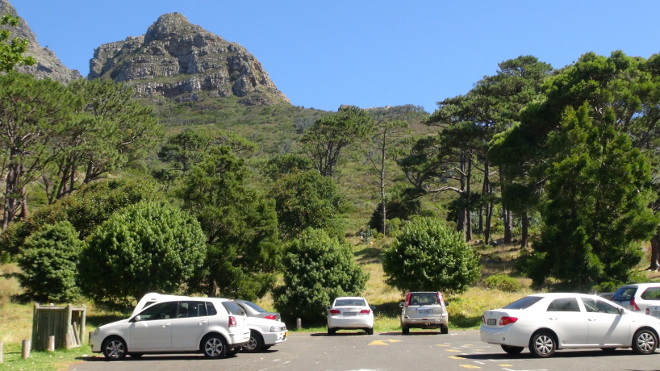 There's plentiful parking at Rhodes Memorial, and not a bad view either! Here you can see Devil's Peak from the parking lot. There are a couple of hiking trails which start at the top of the parking lot. There are steep drops at a number of points on the memorial, without railings, so children should be closely supervised. 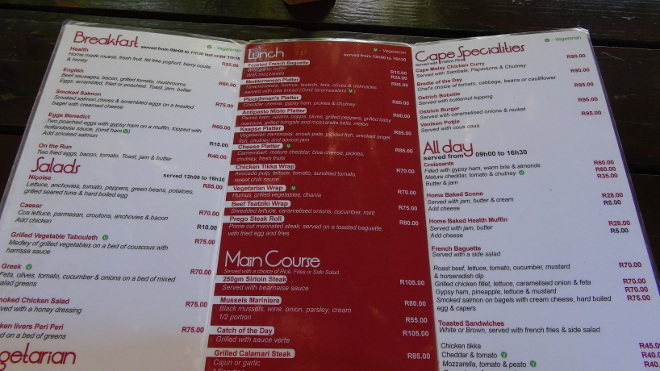 The Rhodes Memorial restaurant is open from 9am to 5pm every day. 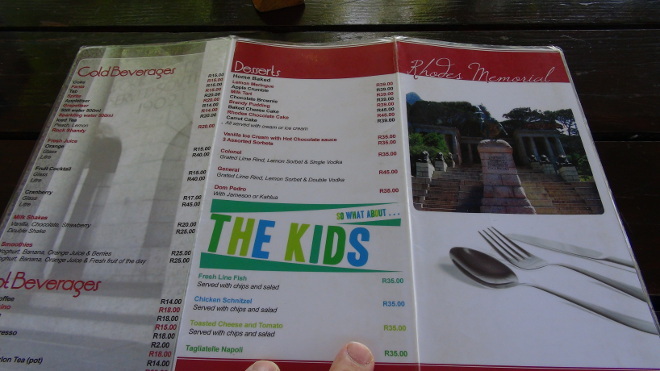 Phone 021-687-0000 to make a reservation (or email info@rhodesmemorial.co.za). 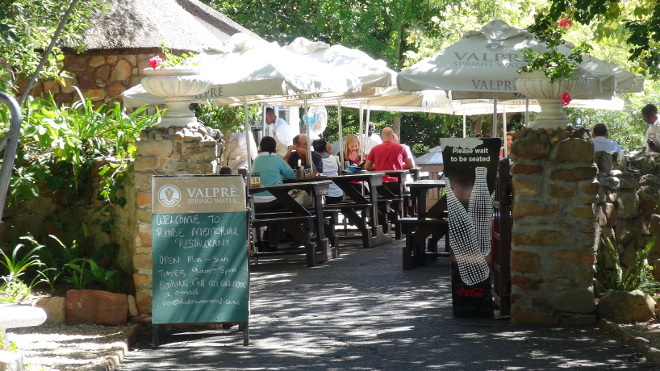 Although Devil's Peak is exposed to the elements, there is shade offered by the plentiful trees at the restaurant. It's child-friendly, with a play area consisting inter alia of swings, monkey bars & a sandpit. While you eat take in the views.